Car Enthusiast, Or Young-At-Heart, There's A New Vintage Car Park In Town! There’s a new park that has opened in Bomanahalli, if you’re wondering why it’s creating so much buzz - it is a car park which houses vintage cars! The car park brags of nine vintage cars popular between the 1940s and 1950s including the Chevrolet Bel Air, Austin-10, Beetle and the Morris Mini Van. 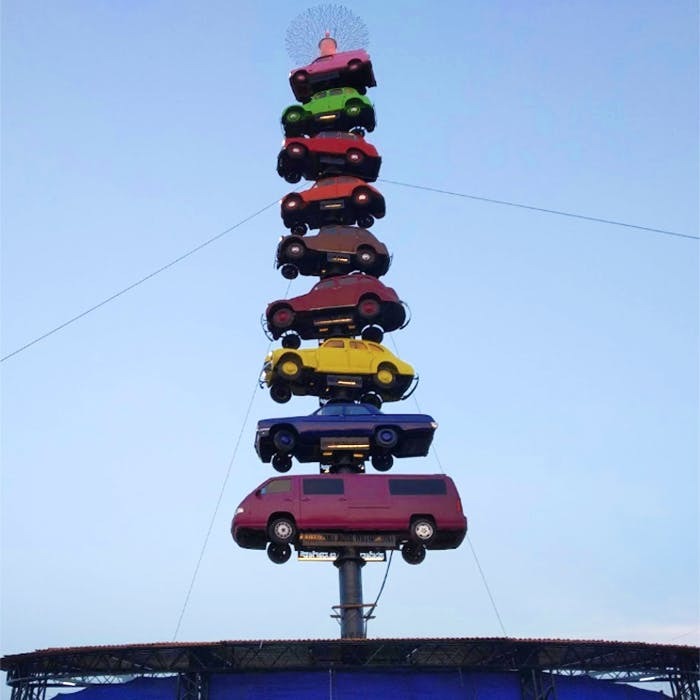 They’ve created an installation of cars arranged on top of each other (120 feet we're told) that can be spotted from a mile away. The park also includes an amphitheatre with a seating capacity of 3,000 people along with a sandpit for your kids to…well, be kids! If they prefer live interactions, look out for the enclosure with rabbits and tortoises. Speaking of animals, the park also features structures of animals made of scraps and waste from old cars. With the intent of getting kids of today’s age to understand the importance of environmental conservation, the project aims to facilitate learning through entertainment. Apart from cars, the Bruhat Bengaluru Mahanagara Palike (BBMP) has also used junk from cars to create Kannada alphabets. The sculpture has been erected along the car park as a fun way to get visitors to pick up the language. It’s managed to create such a buzz that the BBMP has been getting calls from Germany and America appreciating their efforts (well-deserved, no? ).